A major rescue mission to save 25 crew members was launched when their stricken cargo ship grounded in the Solent last night. All the crew who were on board the car carrier, Höegh Osaka, have now been accounted for, the coastguard has confirmed. Some were airlifted off the ship by the coastguard helicopter from Lee on Solent, while others were rescued from the sea by the three lifeboats that were on scene. The search and rescue mission was co-ordinated by the National Maritime Operations Centre at Fareham. Three crew senior officers who had remained on board the vessel to assist with salvage operations have now also been airlifted off the vessel, the coastguard said. All the crew have been taken to a survivor reception centre at MCA Daedalus, where they have been received by the Hillhead Coastguard Rescue Team. The Mission to Seafarers were informed and have been assisting the crew. The incident started yesterday evening, when the vessel grounded on the Bramble Bank, in the Solent. Southampton VTS sent tugs to the scene to assist with the vessel and the RNLI lifeboats from Calshot, Yarmouth and Cowes were launched. 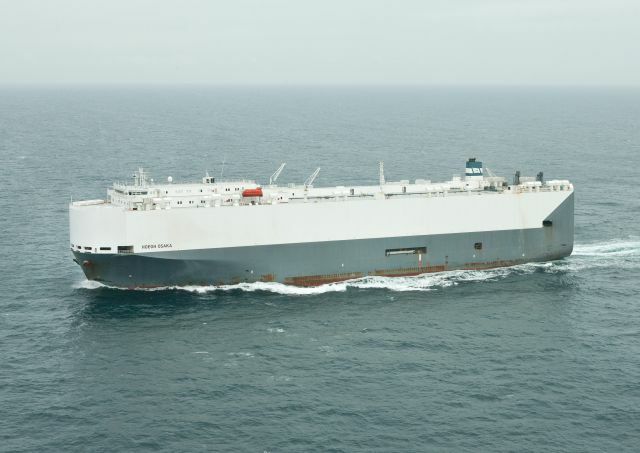 In a statement, Höegh Autoliners said: ‘Höegh Autoliners are currently assessing damage and stability issues on board its vessel, the ‘Höegh Osaka’ which suffered a heavy list earlier yesterday evening after leaving Southampton Port. ‘Höegh Autoliners primary concern has been for the crew on board and it has been confirmed that one crew member has been injured and he was airlifted to Queen Alexander Hospital in Portsmouth with non-life threatening injuries. A coastguard spokesman said the car carrier remains grounded on the Bramble Bank, listing at 45 degrees and the Maritime and Coastguard Agency’s Counter Pollution Team will continue to monitor the vessel which is currently assessed as being stable. The vessel’s owners have appointed the salvage company Svitzer and a salvage team is on its way to the scene today to make an initial assessment. Salvage plans will be developed by Svitzer and reviewed by the Secretary of State’s Representative for Maritime Salvage & Intervention, (SOSREP). There is no impact on vessels transiting the Solent as the vessel is not within a shipping channel.